Since I was a little girl, early elementary age, I feel like I have been pretty in tune to the world around me. At a young age, I understood full well that money was not something that was plentiful at our home. My father was diagnosed with Type 1 diabetes in his early twenties, shortly after I was born. He also had some other health issues that required surgery and hospital stays causing the medical bills to pile up. I also understood full well that my father was an extremely hard worker and was doing everything he possibly could to provide for our family. My mother too, worked outside the home to try to make ends meet. It was just a rule whenever we went to a store that we were never allowed to ask for anything. Not even the candy or gum that was staring at you in the face when you were going through the checkout lane. I understood that “extra’s” just couldn’t be afforded. At one point, I remember very specifically sitting at the table with my father in the evenings, licking the green food stamps that we put on little “BINGO” looking cards. When those cards were full, we both would go to the grocery store and “buy” milk, bread, and cheese. Looking back, I am sure that had to be a bit humbling for my dad, but he has never been the proud type. He did what he had to do and as a little girl, I watched him and took it all in. One Christmas eve, our family gathered in our living room. We had big windows in the corner of that room and a Christmas tree filled that space for the people on the street passing by to see. The thing however that was probably different than other families sitting by their Christmas trees that evening was that ours didn’t have any presents under it to open. I remember that my mother and us kids were sitting on the floor, and my father stood up. He told us that this year, due to the circumstances of that year, there just wasn’t going to be presents for us. But right at that moment, the front doorbell rang. My dad went to the door and I got up and did the same. There stood a man, holding a box, and handed it over to my dad. He took the box, closed the door, and placed it down by the tree. Then he opened it and started to take out little wrapped gifts, and on those were our names. We each took a turn opening those gifts, and my gift that year was a small angel ornament. Honestly, I thought it was kind of ugly looking, but none-the-less, I knew full well that I had to be grateful, and I was. I understood that as a little girl. Throughout the years, us children always received a new ornament every year, so that someday, when we moved out of the house, we would have enough to cover our own Christmas trees. When it was time for me to leave home, I took with me my box of ornaments, each one representing a year of my life – memories. And that little angel ornament was tucked in with the rest of them. Fast forward several years later. My husband and I had just moved to Wisconsin. We lived in an apartment complex that had an underground parking garage, and each apartment had it’s own little closet in that garage to store extra items. So, when we moved there in the early summer, we brought our Christmas tree, along with all Christmas décor, winter coats, etc. and put it in that space to store. When December rolled around that year, we went down to that little storage closet and opened it up, anticipating gathering our Christmas tree and décor. At some point between the time we moved and the time we went to gather our Christmas items, the space had gotten wet and mold covered EVERYTHING. Our winter gear was dripping in mold. Our Christmas tree was ruined. I started to open the box of the ornaments that I had received every year from the time I was a baby to the present day, and found that mold had made it’s way inside of that too. Very slowly, one by one, I started to remove those ornaments to assess the damage. 95% of the ornaments I had to throw away that year. 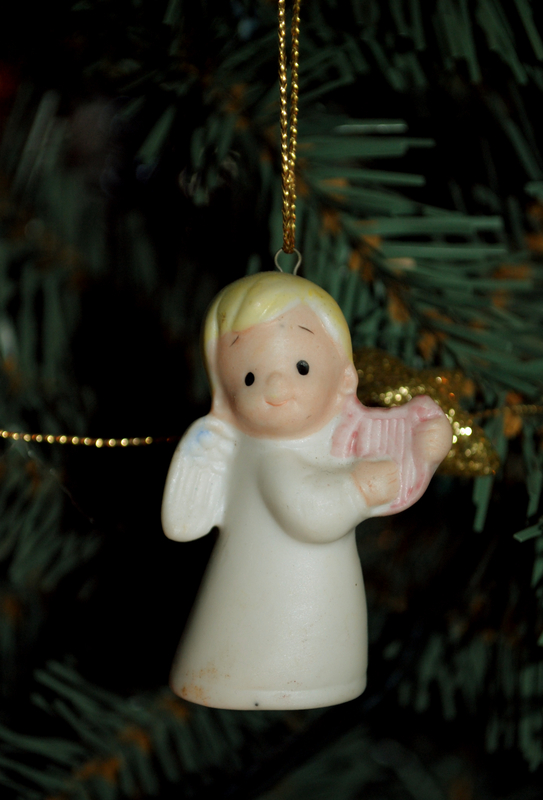 But as God would have it, when I went to pull out that little angel ornament, not a single drop of mold was on it. I looked it over multiple times and I could not find any mold. It was placed in the middle of all the other ones that were covered in mold, and yet, it was not ruined. Each year now, as I go to decorate my Christmas tree, I pull out that old angel ornament, handle it with care, and place it upon my tree. Each year as I do, I am reminded of where I came from, the grace that God had on our family all those years ago, and am reminded that despite what life hands you, our Father protects us. I sometimes feel that this verse is misunderstood in today’s culture. People who read it tend to think that this verse means that God will protect you from suffering or pain. That is not it AT ALL. It does mean that God has plans for each one of us, and until we have fulfilled that purpose on this earth, we can have hope and know that He is with us and will help us along the way. I just want to take a moment to encourage anyone who feels that they are stuck in the midst of an unfair time of life, or if they feel that things are just not going their way. It is hard, isn’t it? But you know what? It is going to be OK. If you can just try to remind yourself that God has plans for you – plans of prosperity – your perspective will start to change! None of your struggles have to be in vain if you place your trust in the One who is in control of it all. I am happy to say that while times were not easy, from what I can tell, I always had the material items that I needed growing up. I know those items sometimes came with a price – financially, or worse with judgment from others. (That was actually easy for me to notice) But I could also tell that my parents placed their trust in God. And God supplied what we stood in need of. And the whole time, He was using it to mold (no pun intended!) me into the person I am today. I know because the Christmas Angel reminds me year after year. Welcome to “The Beautiful Gate”. I am thrilled that you have arrived! My prayer for you is that you may take a moment to sit back, relax and know of the love, grace, power, mercy and healing that can take place through Jesus Christ. I desire for this to be a place of encouragement and a way to give praise back to God for the good things He gives us…even if it is not the things we were expecting. Acts 3:1-10 tells us of a story where Peter and John were arriving at the temple for their afternoon prayer and they came to the gate called Beautiful. 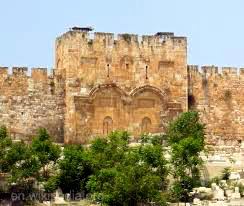 This gate was larger and more lavish than the others and it was the entrance of choice for many of the people. This was also a place for public worship. There was a certain man, crippled from birth, which was brought each day and laid at this entrance. Being a mother of two boys, each with their own special needs, I can’t help but find joy in the fact that this is the place where the special needs people gathered…a place called Beautiful. They came to beg for money and food, to get recognized and affirmed, but in this passage, so much more happened. As Peter and John arrived, the man asked them for money. I imagine his eyes were downcast and his self worth was next to nothing. He knew he was different than all the others and that he could not care for himself the way he wanted too. His life was lived by relying on others. Peter asked the man to look at him, to lift up his eyes and to see his face. The man listened, expecting to get something from him; most likely the money, silver or gold, he was asking for. After looking at this man, Peter and John showed love and allowed God to use and work through them. Peter replied, “Silver or gold I do not have, but what I have I give you. In the name of Jesus Christ of Nazareth, walk.” At that instant, Peter grabbed the man’s hand, he became strong and true healing took place. There was no doubt in the healing between Peter, John, the cripple or the crowd that was there. The man immediately walked, leaped and praised God. All who saw it were filled with wonder and amazement. This event led to the opportunity for Peter to share with all the people who suddenly gathered around him. (Verses 11- 24) Right there, at a place called Beautiful, Peter shared that it was not his own power that healed the man, but it was only by the power of Jesus Christ. He also told them that Jesus was no longer dead, but alive, and they needed to repent of their sins and believe in Him, to place their faith and trust in Him alone and they would be saved. Many came to find Jesus as their Savior that day. I think in years past, when reading this story, I would briefly think, “What a nice story. Yep, God can heal cripples”, and then just keep reading on. I never stopped to dwell on it. But one day, that changed. During one of my quiet times several years ago as I was reading this chapter, these verses jumped off the pages, lodged into my heart, and I have been thinking about it since. It might be a story that many would not spend a lot of time on, but I viewed the gate called Beautiful in a special way that morning that I will never forget. That particular day, the Holy Spirit started to stir something in my heart that has finally led me to here. During my elementary, middle, and high school years, I was never that student that excelled at grades. I was very average or below average in that regard, and I was completely fine with that. I am almost positive that I didn’t produce anything amazing that involved writing during my Language Arts class. What I remember most from that class was my buddy that I sat by. Unfortunately, that really doesn’t help me out right now. What I do have right now however is a burning desire to share certain experiences and the lessons that I have learned through them. Over the years, the Lord, has allowed me to experience a wide variety of things, which while not always fun, I have learned to become thankful for them. One of those experiences, both joy and trial intertwined together, was the birth of my second son, Noah. Due to a rare genetic syndrome and chronic health issues, I started a Caring Bridge site for him. Now, almost 9 years later, and over 1000 journal entries related to our boys, (the older with ADHD and High Functioning Autism) I have found that writing is something I have grown to love and need to do. I have discovered that it makes me feel better and it releases a tension that can build deep down inside. It helps me to slow down, to listen to the things the Lord is trying to tell me, and to process my thoughts. Most often I find it is more for my own teaching and reminding than it is for those who are reading it. I know the same will be for this. Several years ago, when reading that passage in Acts 3, it was not an awesome time of life. It was a day-to-day struggle doing 24-hour medical cares on my son, my Physician husband working long hours, and just dealing with so many changes that had happened in my life. So when I saw that the place where the people with special needs would sit and gather was a place called Beautiful, I actually cried. And I don’t cry very often; not near as often as I probably should. I was finding it difficult to find beauty in life at that time, but I felt that the Lord gave me a little piece of treasure that day. A change in perspective along with an opening of my heart and mind to see the beauty around me, and in turn, I became exceedingly grateful. There were days when I felt like the cripple; I was physically worn out, and emotionally and spiritually I felt stuck, like I was not going anywhere on my own. My spirit felt down and it was hard to turn my face upward towards God. But then I would attend Bible study and dig into God’s word. Bible study is with a group of woman whom has become some of my best friends, and over the years, they have been very patient with me and let me talk and talk and talk. Then, I would come home and write and process the things the Lord was speaking to me. I was turning my face upward and getting something in return that I wasn’t expecting. I would be left knowing that despite the storms of life, grace was a gift that was pouring down. It was drenching me deep into my soul and healing was taking place. I closed my eyes and realized what this grace was and where it came from. Jesus Christ…my gate to grace. Since then, I try to make a conscious effort to find the good, and to respond with thanks and praise in the everyday. Are you hurting? Do you feel weak in a specific area of your life? Does your soul feel downcast? Does Jesus feel so far away? We, each with our own special needs, whether it is physical, mental, emotional or spiritual, let’s take time and turn our face up toward God. We may not always get what we are expecting or asking for, but we can trust that we will get something even better in return. Just like the crippled mans legs were made strong, the Lord will equip us and make us strong in the special chosen areas of our lives in order to do the work that He has prepared for us. I find comfort in knowing that even at my worst, even if life isn’t going the way I would desire, even if I feel crippled in such a way that is preventing me from moving forward, and even if I find myself begging God for a specific desire that he has not yet granted, that God has not overlooked me or passed me by. Friend, there is no promise given to us that life will be easy. But there is a Bible full of promises that provide hope, comfort, and healing that will be given in the name of Jesus Christ. Like the cripple, let’s desire to walk, jump, and leap in such a way that those who see us can see the work of God! And that is my biggest desire for this entire blog. That God may be glorified in the every day…the ordinary, the unexpected, the pain, the joys, the learning and healing, and that He will look down upon it and see it as a place He can call Beautiful. Some day, like that crowd of thousands who came to place their faith and trust in Jesus alone, we will join them at the gates of heaven. He will call out our name, we will lift our eyes, see His face, and I know we will arrive to new gates that will be beyond any amount of beauty that our human minds can imagine. But once again, God gave me some grace-filled affirmation this morning that I didn’t even ask for. When I sat down at my desk, turned over my daily devotional flip calendar, this is exactly what it said, “It doesn’t have to be perfect to be beautiful.” (The Nester, Nesting Place) Thank you Jesus! I just desire to be obedient to God and to really allow the Holy Spirit to lead and guide. It is my hope and prayer that as you visit this site, you may be blessed and encouraged as you walk your own path in this life. Won’t you join me at the gate? A place where I want to open my heart and mind, to write about the glorious work of God in my life; understanding that it is not through me, but through Him that beautiful things can happen.